Lot:2085 1851-O Liberty Head Double Eagle. Winter-2. AU-53 (PCGS). 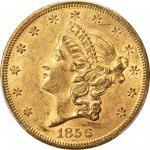 1851-O Liberty Head Double Eagle. Winter-2. AU-53 (PCGS).Thoroughly appealing honey-live surfaces are fully original with most design elements boldly to sharply defined. Lustrous for the grade and a delight to behold. The 1851-O barely edges out the 1852-O to rank as the most readily obtainable New Orleans Mint double eagle. This issue is still scarce compared to early date Philadelphia Mint issues in the Liberty Head series such as the 1851 and 1852. The 1851-O is also a conditionally challenging issue and, among the 750 or so coins believed extant, most are well worn and grade no finer than Choice EF. As a solidly graded, aesthetically pleasing AU, this handsome piece is sure to catch the eye of astute buyers.From the Fairmont Collection.